Elspeth Smelser, webmaster, Historical Automobile Society of Canada who helped us start our web site. The TBB History was taken from Glen Midgley's liner notes for The Toronto Banjo Band Special Edition CD. Glen collaborated with Jim Groulx and Dave Robinson to get the whole story. All Band Members: without your participation, we wouldn't be here! The TBB banjo logo on the Home Page was created by our former webmaster, Bruce Manning. Items on this site are presented as a courtesy only and change often. If other groups/acts are shown, please contact them for further information. Toronto Banjo Band webmaster, Al Pounsett . 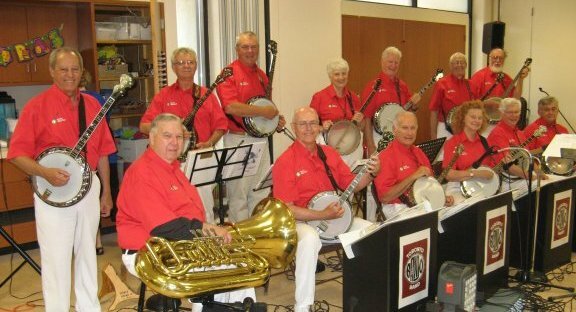 The Toronto Banjo Band at the Baycrest Community Centre for Seniors in Toronto.